for religious women. She spent the last thirty years of her life in her cell, doing penance for her sins, fending off attacks by the devil, and instructing women in religion and handiwork through its one small window. Hathumoda, the daughter of a noble Saxon couple whose progeny would establish the first German empire, became abbess of a similar community of women when she was twelve years old. She too spent the rest of her life there, dying at the age of thirty-four in the course of an epidemic that swept across northwestern Europe. In spite of their confinement, both women made so great an impression on those who knew them that substantial biographies appeared within a few years of their deaths. 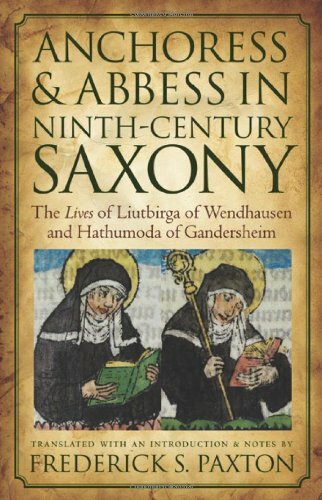 In the growing field of early medieval texts in translation, this book presents the first full English translations of the Lives of Liutbirga of Wendhausen, the first anchoress in Saxony, and Hathumoda, the first abbess of Gandersheim. The introduction and notes tell the story of the remarkable survival and transmission of the Lives and describe the ninth-century Saxon world that produced them and their authors. Although praised by their biographers for their holiness, Liutbirga and Hathumoda are not presented primarily as wonder-working saints, but as real flesh-and-blood women, pursuing sanctity in a world driven by family and ecclesiastical politics as much as spirituality. Histories of the women's families as well as memorials to their heroines, the Lives of Liutbirga and Hathumoda shed new light on a vibrant corner of Christian Europe in the century after Charlemagne.